With large image databases becoming a reality both in scientific and medical domains and in the vast advertising/marketing domain, methods for organizing a database of images and for efficient retrieval have become important. We have worked on three different aspects of this problem. Andy Berman's 1999 Ph.D. thesis on Efficient Content-Based Image Retrieval was a seminal work that developed new indexing techniques for image databases using images as the indices. In this work, the triangle inequality for metrics was used to compute lower bounds for both simple and compound distance measures. These bounds allowed the retrieval system to rule out large portions of the database and to order the remaining images approximately according to their similarity to the query. 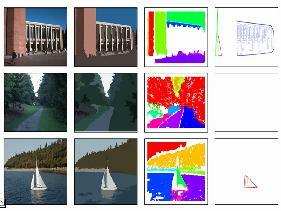 A. Berman and L. G. Shapiro, "A Flexible Image Database System for Content-Based Retrieval," Computer Vision and Image Understanding, Vol. 75, Nos. 1-2, 1999, pp. 175-195. Yi Li's dissertation in 2005 developed two new learning paradigms for object recognition in the context of content-based image retrieval. Both paradigms use the concept of an abstract regions as the basis for recognition. Abstract regions are image regions that can be obtained from the image by any computational process, such as color segmentation, texture segmentation, or interest operators. The first learning algorithm was a generative approach that developed an EM Classifier that learned Gaussian models for different classes of objects. The second learning algorithm was a more powerful Generative/Discriminative Approach that began with EM clustering and used the clusters (in each feature space) to construct fixed-length feature vectors that described each image in terms of its response to each of the components. The feature vectors were then used to train a classifier to recognize the object class or concept being learned. Y. Li, L. G. Shapiro and J. A. Bilmes, "A Generative/Discriminative Learning Algorithm for Image Classification", International Conference on Computer Vision, October 2005, pp. 1605-1612. Y. Li, J. Bilmes, and L. G. Shapiro, "Object Class Recognition using Images of Abstract Regions," Proceedings of the International Conference on Pattern Recognition, Vol. 1, 2004, pp. 40-43. 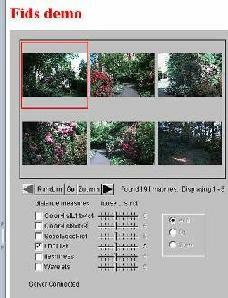 "Object Recognition for Content-Based Retrieval," Invited talk at Dagstuhl Seminar on Content-Based Image and Video Retrieval, January, 2002. Li, Y. and L. G. Shapiro, "Consistent Line Clusters for Building Recognition in CBIR", Proceedings of the International Conference on Pattern Recognition, 2002, pp. 952-6.